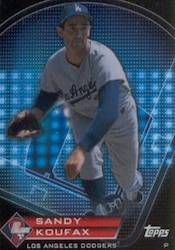 The final week of the 2011 Topps Prime 9 baseball promotion features pitching great, Sandy Koufax. Any collector who has the #9 Prime 9 redemption card from 2011 Topps Series 2 Baseball can take it to their nearest participating hobby shop and redeem it for a limited edition Topps Chrome Refractor of the Dodger icon. 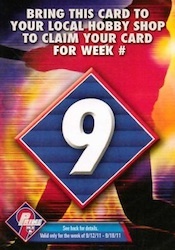 Prime 9 redemption cards are randomly inserted into 2011 Topps Series 2 Baseball hobby and jumbo packs. The Koufax card will be available until September 18th. The now-complete Prime 9 checklist is composed of a formidable starting lineup of past and present greats. The full checklist can be viewed below. Additionally, the back of the redemption cards can be completed to enter a sweepstakes for a trip to the 2012 World Series. The store owner will send completed entry forms to Topps after the refractors are redeemed.